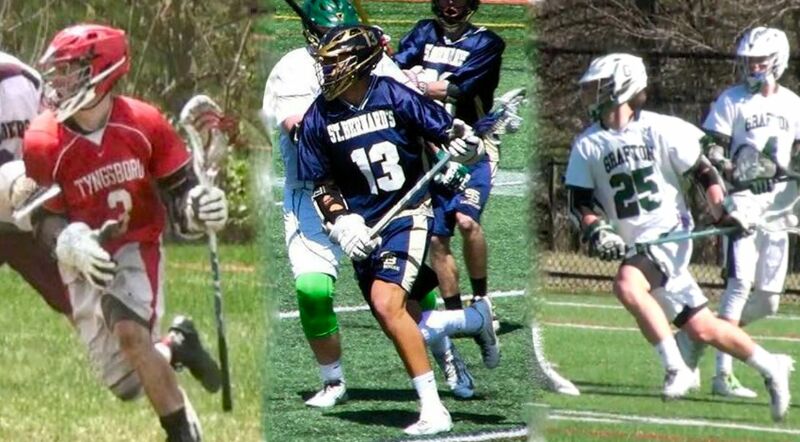 Tyngsboro junior Kyle Laforge, St. Bernard's senior Curtiss Vachon and Grafton senior Chase Kapuscienski all achieved major milestones last week. Normally I wouldn't waste too much time with introductions this late in the season, but I do want to congratulate two kids who achieved impressive milestones this past week. First, congratulations to Grafton senior Chase Kapuscienski, who joined the "300 Club," scoring his 300th career point during his team's win over Wachusett Saturday. Also, a big congratulations to Tyngsboro middie Kyle Laforge. After earning All-American honors as only a sophomore last year, Laforge crossed the 300-point plateau as only a junior this past Thursday. And of course, congratulations to St. Bernard's senior Curtiss Vachon, who became just the 15th player in Massachusetts lacrosse history to reach 400 points, and only the fourth CMass player to ever do so. He crossed 400 Saturday against Bromfield. Both Kapuscienski and Vachon have enjoyed remarkable careers, and each will have a chance to end their high school playing days in the Division 3 state tournament, then continue playing at the next level. 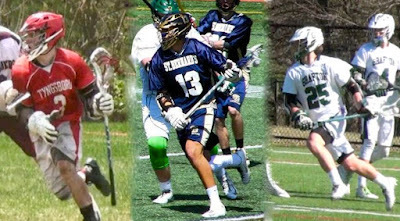 Kapascienski is headed to Mary Washington, while Vachon is off to Wagner next year. Laforge, meanwhile, still has this year's tournament, and his entire senior season to play, before he heads to UMass-Lowell. Clearly, are three have bright futures. Anyways, onto this week's Top-10. Last Week: Ranked No. 2. Defeated Nashoba 11-4, No. 5 Groton-Dunstable 14-10 and Leominster 19-7. Thanks to a pair of upset losses by Algonquin, Westboro's three wins mean the Rangers will share the Mid-Wach A title with the T-Hawks, despite Gonk's sweeping of W'boro. That being said, the Rangers are one of the region's hottest team in their own right, winning five in a row heading into Monday's rematch with Grafton, a team the Rangers defeated 6-5 earlier this season. With a high-powered offense, and an underrated defense led by goalie Jeff Bernard, the Rangers seize their opportunity and claim our top spot. Last Week: Ranked No. 3. Defeated No. 1 Algonquin 10-9. Lost to Longmeadow 12-11. Call that loss to Longmeadow a "quality loss," because I think the now-full strength Lancers are the best team in Western Mass. That said, the real highlight of the week for the Pioneers was obviously their rivalry game win over Algonquin on Saturday. This week brings two new and unique challenges, as the Pioneers host Xaverian today, then travel to Marlboro Wednesday. Last Week: Ranked No. 1. Lost to No. 9 Wachusett 14-11, Shrewsbury 6-4 and No. 3 St. John's 10-9. Not a good week for the T-Hawks, who fell victim to a pair of upsets at the hands of league foes, then couldn't come back to defeat St. John's in the region's premier rivalry game on Saturday. If any team in the region could afford a losing streak, it was Algonquin, but with only a huge game left at Grafton on Wednesday, the T-Hawks won't have much time to re-gain momentum before the tournament. Last Week: Ranked No. 4. Defeated Worcester 9-4 and No. 9 Wachusett 20-11. Lost to Nipmuc 9-8. A loss to Nipmuc will prevent the Indians from finishing with a perfect league record, but Grafton did bounce back to score a nice win over Wachusett. Unlike most teams, Grafton has a ton of respect to play for this week, as the Indians head to Westboro today for a rematch with the Rangers, then host Algonquin on Wednesday. Last Week: Ranked No. 5. Defeated Shrewsbury 8-7 and North Middlesex 10-2. Lost to No. 2 Westboro 14-10. While they couldn't quite get over the Westboro hump, G-D managed to knock off league foe Shrewsbury in a thrilling finish on Tuesday. The only thing left for the Crusaders is to get to .500 in the league, something they can do with a win over Nashoba today. Last Week: Ranked No. 6. Defeated North Middlesex 12-3 and 8-6. Also defeated Oakmont 9-5. Littleton locked up a share of the Mid-Wach B title with three league wins, all while fighting through a flu that had spread through the roster. Littleton will close out its regular season with a big home game against Nipmuc today. Last Week: Ranked No. 7. Defeated Oakmont 11-8, Leominster 17-5 and Oakmont 14-13. The Tigers finished up their regular season on a 12-game winning streak, locking up a share of the Mid-Wach B title in the process. Behind middie Kyle Laforge and goalie Dan Powers, Tyngsboro is suddenly as dangerous, and balanced, as anybody in the region. Last Week: Ranked No. 9. Defeated St. Peter-Marian 18-3 and No. 1 Algonquin 14-11. Lost to Nashoba 12-10 and No. 4 Grafton 20-11. It was an up-and-down week for the Mountaineers, who rolled up St. Peter-Marian and upset Algonquin to start the week, then fell to Nashoba and ran out of gas against Grafton to end it. One great sign for Wachusett is the return to form of its offense, which scored 53 goals in just four games last week. That being said, inconsistency is still a concern for a team that can play with anybody when it's dialed in. The Mountaineers finish their season Tuesday at home against Hudson. Last Week: Ranked No. 8. Defeated Hudson 21-4 and Lunenburg 13-5. The Panthers took care of business last week, but will really be challenged in their final two games of the regular season early this week. First, Marlboro will play host to a Shrewsbury team playing for pride today. Then, the Panthers will host St. John's on Wednesday. If Marlboro wants to grab some regional respect heading into the tournament, it has two great opportunities to do so. Last Week: Ranked No. 10. Defeated Nipmuc 11-10, Northbridge 12-4, Hopedale 14-9 and Pope Francis 12-9. Lost to Amherst-Pelham 11-10. The Warriors shook off Monday's loss to Amherst-Pelham and reeled off four consecutive victories, including a critical league win over Nipmuc. Tantasqua's offense is as lethal as we expected, and the Warriors have chosen the best possible time to play their best lacrosse. They'll finish up the regular season with home games against Shepherd Hill Tuesday and Chicopee Wednesday. I missed that one. Let me double check and I'll add it in. Hat's off to Curtiss Vachon. Not only is he a gifted player, but an outstanding young man. Nice job!!! Yeah - very good lacrosse player who worked hard to get to this level and even a better young man. Curtis - no more tournaments for us - I may have to take some roadtrips to watch all the kids playing in college! Congratulations to the above players. Ive only seen one of them play. I'm sure its well deserved for all of them. That's great about your Mom.......so she has one up on you, HUh? What an arrogant response bud! Does anyone know if, and if so, how many, 300 or 400 pointers have come out of Mid-Wach A in the past 5 or 10 years? Honest question. Don't get all upset. I am not asking to "put down" any of those who accomplished it in the other CMass leagues. I know our All-American, from a couple of years ago just barely made the 200 mark. With 1 goal losses to BC High, a healthy Longmeadow and Xaverian (last goal last goal with goals chasing out of the net) is SJ a dangerous draw in the playoffs ? Expect Marlborough will come at them so will be a good test for playoff mental readiness. I found the answer to my question above. There are three 300+ pointers from MidWach A. All from Gonk. The caveat to this is that I believe one of those three harken back to a time before there was a MidWach A, B, or C. Perhaps even before there were any CMASS Lax leagues. I found this info at BostonLax.net. Probably correct but not 100% certain. Few 300+ goal scorers from Mid Wach A because they don't regularly put up 12-17+ goal margins even when they have the chance. Certainly, the big guns are no where to be found during the 3rd + 4th quarters of those games. Not sure what scoring the 16th, 17th or 18th goal in a 18-5 win really accomplishes, particularly to upstart or struggling teams. Many of these high flyers don't make All-American over guys who play a tougher schedule. Some do earn it, some slip through. Regardless, scoring 300/400 points, even if it is your mother, is quite an accomplishment. To the above statement. I've seen tweets coming from WMass this year, many from a particular team (the coach no less), of their top 2 guys with 7,8,9 goals and 2,3 or 4 assists a game. One that really caught my attention was a player with 9 goals and 3 assists and another with 7 goals and 3 assists in a 22-4 game against a one win team!!! I don't think I've seen anything that bad in CMass this year but there is often times when that type of situation is almost "accomplished"
I have seen kids stay in blow outs from my towns team. Usually to help with younger kids to teach them when to cut and give them quality passes if they do. They haven't stayed in and shot the ball. On the smaller town teams the drop off in talent is severe. Usually the starters are rotated in with all the reserves to keep some sense of coordination with the offense and defense. It appears to be like a coach on the field. That is what i have seen on our team. I have seen the JV kids called down from the stands to play the 4th quarter. But the score was still very lopsided so from the outside sometimes it appears from the score and numbers that kids played the entire game full force trying to pad their scoring, but it may not always be 100% accurate. What if the 7 goal 3 assist all came when the score was 10-3 ( unlikely but you never can tell without being there. )But I do see the point. It seems the 10 goal and under is legit. Also, if your 3rds and 4ths are moving the ball around a couple times then scoring on the other team's 1st D and G, what can you do about it. Intentionally turning it over? No way. You still need to play. Now, if the stud is scoring goal #7 in a 17-4 in the 4th qtr that is lame!!!! I've heard that there is a gentleman's agreement in Mass, dating back to the stone(d) age (1970s) that teams should try to keep blowouts at 19 goals or under. Many abide, some do not. Discussing this with a MidWach A coach some time back, there seems to be a 10 +/- goal gentleman's agreement. -The other night GD put up goals quickly on Nash. 7-1 at half and 10-2 at the 3rd qtr. All 2nds, 3rds and 4ths were in by then. The game ended 12-3. -The GD coach apologized to the Shrew coach at the end of their first game for a soph scoring the final goal of the game (12-4 I believe) on a transition play with a couple of minutes left. -I mentioned a couple of weeks back how Martens from Gonk (prob the best, or top 3 players at least in CMass) had an open net as GD had their goalie chasing the ball with about 1:30 to go, and he held the ball and ran away from the front of the cage. The score was 8-4 at that point.